23 Aprile 2018 | in English. Hundreds of migrants and supporters break through Gendarmerie lines at the French-Italian border; the fascists of Defend Europe pack up and remove the “blockade” at the frontier. Last Friday a group of Italian and French fascists of the Defend Europe/Generazione Identitaria network reached the Colle della Scala pass, at the border between Italy and France, installing a construction yard fence which was several dozens of meters long, in order to block the crossing of the border through the mountains by migrants. A farce worthy of these infamous that, however, thought well to line up on a spot of the mountain prone to avalanches - one that is no longer used by the migrants trying to reach France. Yet, Italian media immediately took the bait, largely covering the news with honors. It was an unacceptable provocation for a territory like the Valle di Susa, an always proudly antifascist one, and for the many supporters that in these months organized themselves in order to help the migrants at the border. 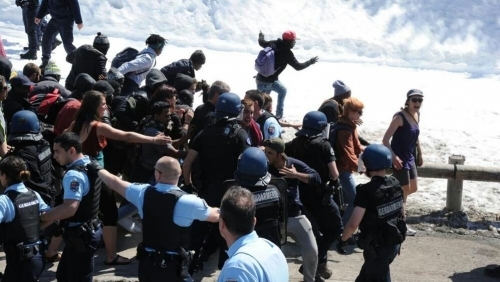 After the news, an immediate call to mobilization in order to reach the border and chase fascists away was issued, and in the late Sunday morning a convoy made by 300 migrants and supporters left Claviere towards the border. At Monteginevro the cortege broke through the gendarmerie cordon, lined up in order to defend the border; first by forcing it to retreat for several meters and then overwhelming the French police agents and circumventing the blockade. In spite of some efforts by the Gendarmerie to make random arrests, all the people of the convoy managed to pass and the cortege proceeded towards Briancon, where it still is now. Meanwhile, news came about Defend Europe fascists packing up and removing their blockade after guarding for several hours the wrong frontier. A few days before April 25, the demonstration today violated the dispositif of a border conceived by rulers, fascists and police as impenetrable, in order to reaffirm that no space will be left for those wanting to raise walls and making Valle di Susa the European barracks.